Northwestern prepares to dive into the pool. Both Wildcats squads topped Notre Dame, with junior Jordan Wilimovsky, sophomore Lacey Locke and sophomore Ellen Stello all winning individual events. Northwestern (5-4, 1-2 Big Ten) got a small measure of revenge in Ann Arbor, Michigan, on Saturday, defeating Notre Dame (5-8) 154-146 after a close loss to the Fighting Irish last year. The Wildcats couldn’t match up with No. 8 Michigan (7-2, 5-0) though, falling to the Wolverines 199.5-100.5. It was a busy winter break for the Wildcats, as the team traveled to Boca Raton, Florida, to take part in extensive training sessions down in the warm weather. But this trip to Ann Arbor started out on a less auspicious note, as an accident on I-94 caused the bus ride to be a seven-hour endeavor. That lack of practice showed in the Cats’ first event. The Fighting Irish took two of the top three spots in the 200 medley relay in their dual meet against NU to jump out to the lead. But the Cats adjusted from there. 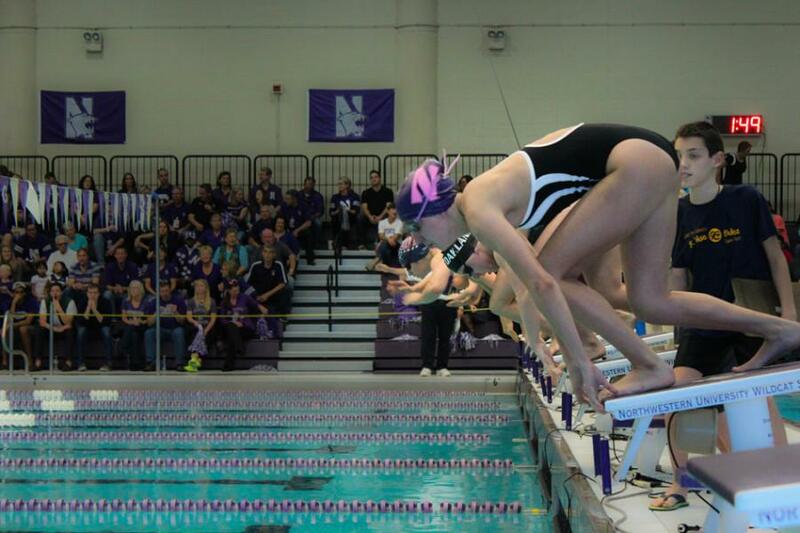 Against the Fighting Irish, NU took the top three scores in the second event of the meet, the 1650-yard freestyle, and the top two scores in the third event, the 200-yard freestyle. But Notre Dame battled back, and the Cats were a bit on the ropes in the middle of the meet. Indeed, NU came all the way back. Highlighted by high finishes from sophomores Lacey Locke and Lauren Abruzzo in the 200-yard backstroke and the 500-yard freestyle, respectively, the Cats crawled closer. And they closed the deal in the last event, with the top two finishes in the final relay against Notre Dame affording them the points they needed to win. The Cats never truly competed with the highly-ranked Wolverines, but Tierney was ecstatic about his team’s performance in Ann Arbor. On the men’s side, NU (6-3, 0-2) finished squarely between Notre Dame (2-4) and Michigan (8-0, 4-0) in Ann Arbor on Saturday, beating the Fighting Irish 173-127 but falling to the No. 6 Wolverines 178-114. Like Tierney, coach Jarod Schroeder heaped great praise on his squad. Among all three teams, junior distance swimmer Jordan Wilimovksy won the 1650-yard freestyle, defeating his Michigan rival Anders Nielsen by more than three seconds. Wilimovksy also finished second in the 500-yard freestyle and fifth in the 200-yard butterfly. Senior William Rosler emphasized the importance of the victory over the Fighting Irish.